Parks and Ride: Tour Uncovers Lesser Known Local Green Spaces. The Southside of Glasgow is blessed with a number of wonderful green spaces, the most well-known of these is undoubtedly Queens Park at the top of Victoria Road. Govanhill Park, where the Govanhill Festival Parade began, is also popular and well-used. The Parks and Ride tour aimed to introduce people to the lesser-known green spaces in the area, such as Brennan Square, the Croft and Riccarton Park. 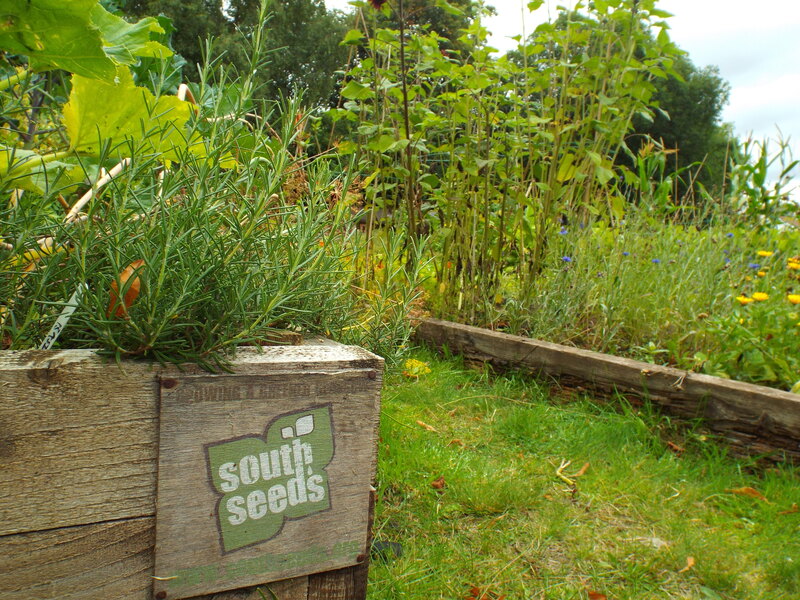 Our first stop was a tour of the South Seeds Croft with Lisa. 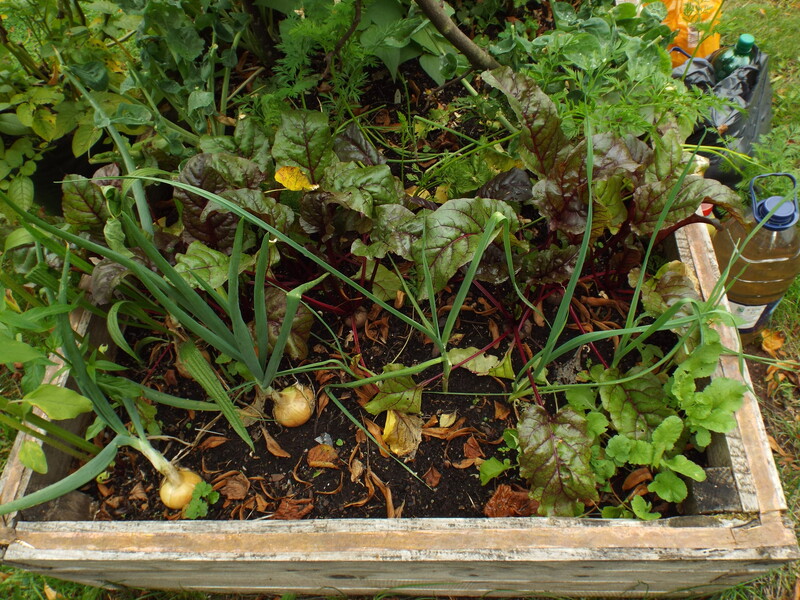 Half of the community croft is used by Locavore and the other half is filled with raised beds for use by the community. After a brief stop off at the Westmoreland Street Gardens, the tour continued to the Allison Street Community Garden, where we learned about how local young people have been involved in transforming the area. After this the walk moved on to Brennan Square, a little-known spot surrounded by postwar housing, much loved by those who live around it. Next to the square one resident has placed a sign with directions detailing the various waves of immigration to Govanhill. From Brennan Square followed a brief journey to Riccarton Park. Riccarton Park was created in 1994 as a collaborative project between the Glasgow Development Agency in association with Scottish Enterprise and Glasgow City Council. This local park offers visitors two synthetic surfaced games courts – one equipped for basketball/netball and the other for five-a-side football. There is also a children’s play area equipped to cater for all age ranges and with ample seating. This park is one of 27 in Glasgow protected in law through a Fields in Trust initiative, meaning they can only be used for recreational purposes. 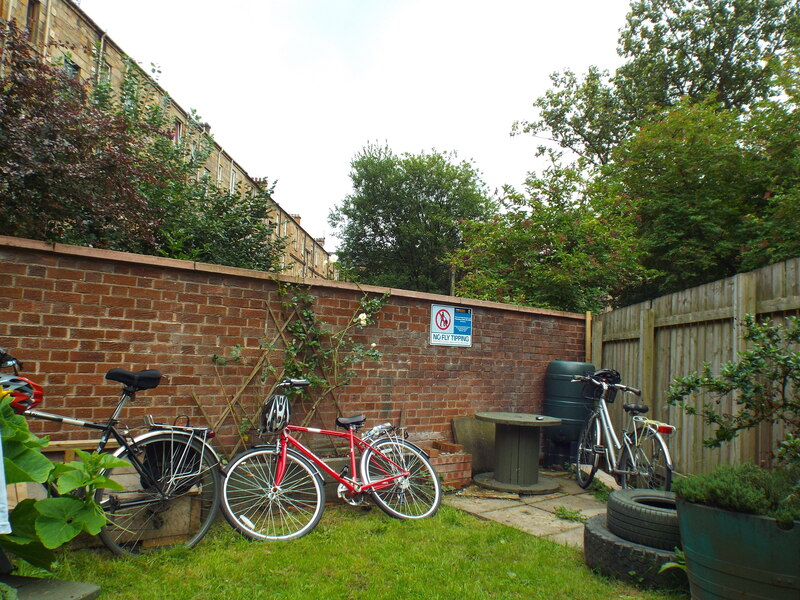 The penultimate stop on the tour was the Govanhill Housing Association’s own community garden. 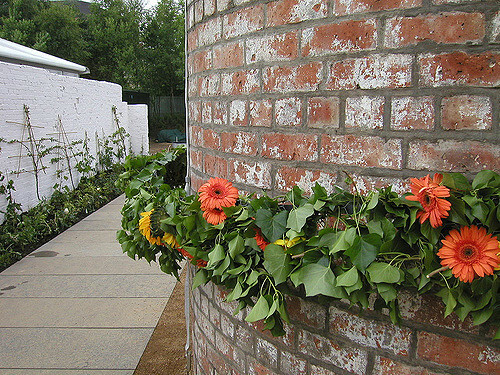 The garden itself was closed at the time of the tour as works are taking place to improve the space and make it accessible for disabled people, with the intention to creative a fully accessible space for people with all kinds of physical and sensory disabilities. Participants were able to sneak a look inside and get an update on the works taking place. 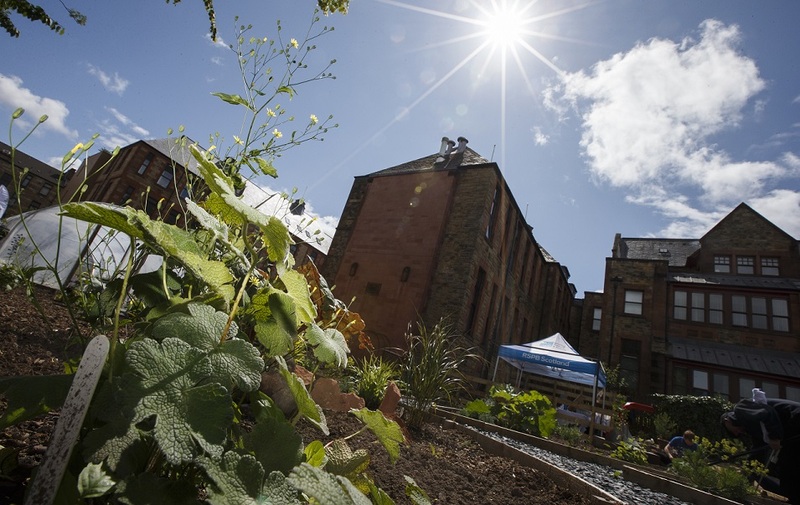 The Govanhill Community Garden when it was opened in 2014. The last stop took us out of Govanhill to one of the better-known local spots, the Hidden Gardens. Development worker Wing met us with an array of information about how to make the most of their beautiful space. The route followed by the tour is detailed below. Govanhill Community Development Trust hope to run this again in the future in order to introduce people to overlooked local spots. In one case, a participant had lived in the area for over 30 years, but was introduced to several new spots through the tour. 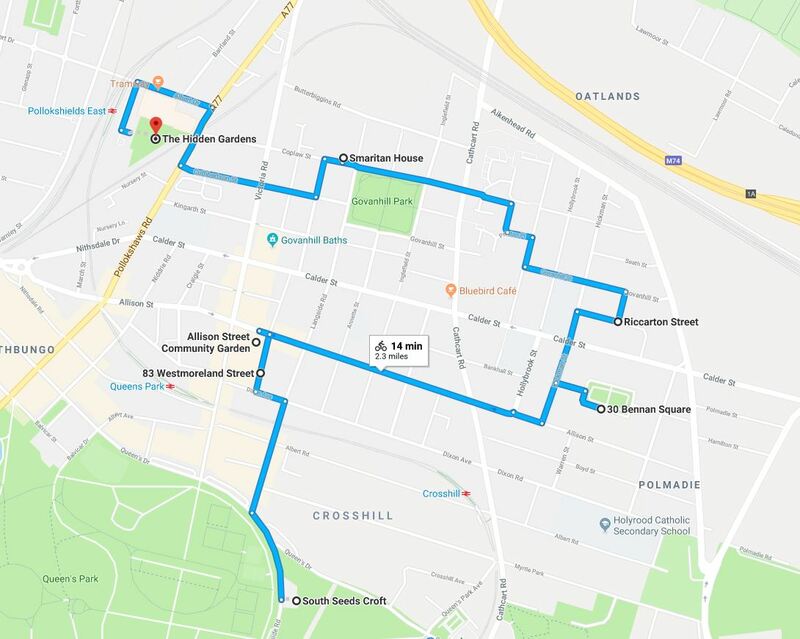 The route taken by the Park and Ride tour – 2.3 miles in total.